Whether you played the original or not, Drawful 2 is a great excuse to gather a few friends, uncork a few drinks, and spend the evening indoors, laughing with (and occasionally at) each other. At this point, I think we can safely hand over the crown; Jackbox Games has solidified its position as the king of party games. As I have mentioned in my past reviews, I’m a huge fan of local multiplayer games. There’s something deeply satisfying about playing games with some friends on the couch, and although online multiplayer is infinitely more convenient and central to many titles, there will always be the niche crowd who enjoys playing games in the same room as others more so than over the internet. Although games like Towerfall and Sportsfriends can be great for those in a competitive mood, party games suit a more relaxed setting. A few friends, a handful of beers, and a great party game are the perfect time sink, and this is where Jackbox Games shines. Their quirky brand of comedy/trivia games are simple enough for non-gamers, and the ability to play their titles with smartphones and tablets ditches the need for daisy chaining controllers or digging out plastic peripherals from the storage closet. While we’ll have to wait a bit longer for the follow-up to the second Jackbox Party Pack, Jackbox Games is tiding us over with a sequel to their hit drawing game. 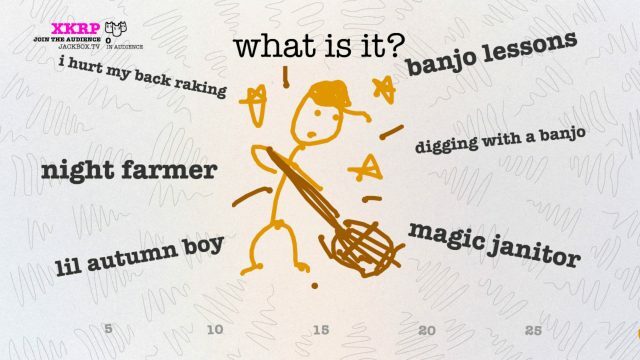 Drawful 2 might feature the same core design of its predecessor, but the quality of life improvements and additions solidify it as another excellent party title. For the uninitiated, Drawful 2 is a Pictionary game of sorts, one that is (based on me asking around) is often fueled by alcohol and pizza. Each player, using a smartphone or tablet, is provided with a prompt to draw, from mundane things such as “stinky cabbage” to something more complicated such as “morning news team.” With a minute to draw, the game places more of an emphasis on curating funny moments rather than asking players to craft works of art. Aside from the time limit, there’s no way to erase any part of your picture, and you can’t reset the canvas either. With a limited color palette to work with, drawings come down to efficiency and simplicity rather than complexity, making it more accessible for players of all types. Once your work of art is finished and submitted, the other players get to view it and take a guess at what it was that you were attempting to draw. From there, everyone’s guess is voted on; you get points if players pick the original prompt you were provided with, but everyone else can get points by fooling players with their own prompts. For the most part, you’ll often see differently worded versions of the same prompt for voting, but every so often a picture will stump everyone, paving the way for some rather interesting takes on drawings. In my circle of friends, phrases like “nice people” and “Cleveland” have taken on entirely new meanings. 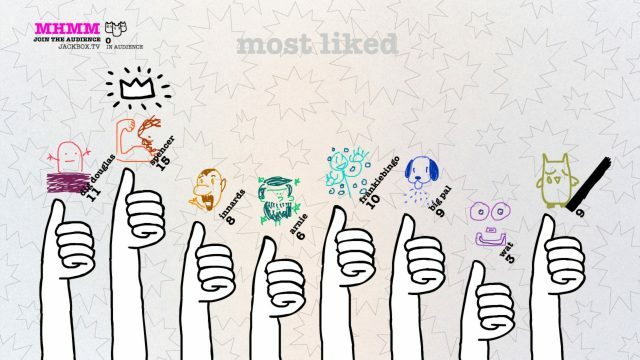 For those who aren’t interested in traditional scoring systems, there’s also the option to dole out a ‘thumbs up’ to your favorite player-submitted prompts, and at the end of the game, a winner is crowned based on receiving the most ‘likes,’ along with a winner being crowned for having the highest score. As I mentioned before, the core game is largely similar to the original Drawful, yet a number of small changes notably improve the experience. A few of my friends had an easier time connecting to the game’s website (which is needed to play the game), and we suffered no dropped connections when playing. More points are handed out for keeping a streak of correct answers going, and the ability to draw with two colors this time around is a great addition. 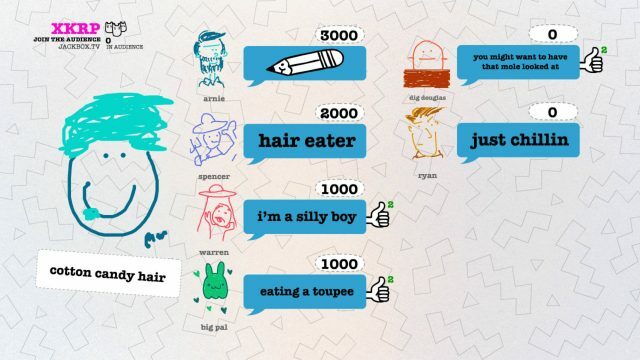 While Drawful 2 shines as a multiplayer game, it also works surprisingly well when streamed online, especially for those who find themselves devoid of friends in the same town. Built in Twitch support is a big boon for streamers; while the game only supports up to 8 active players, a streaming audience (of up to 10,000) can offer their own two cents, voting on answers and influencing player’s scores. You can enable an option which requires players to be logged into Twitch (to avoid trolls and such) and you can censor images and prompts that could be deemed offensive. For the family-oriented gamer, there’s also the option to exclude more adult content, so you can have fun with the whole family. You might be quick to dismiss Drawful 2 as a shameless, cash grab sequel, but it’s anything but. The level of polish and quality of life improvements make for a better game, and the added options for streamers shows that Jackbox Games is more than willing to cater to the needs of their fans. If you are looking to test our your drawing and deception skills with a few friends or your adoring subscribers on Twitch, Drawful 2 might just be what you were looking for.